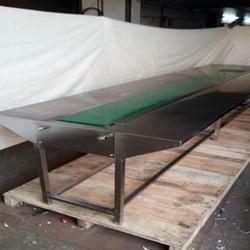 As per the diversified need of our valuable clients, we are devoted towards offering Packing Conveyor Belt that is having stainless steel table top with moving endless sandwich belt in the center. Our conveyor belt brings the container or products from the labeling/blister/strip machine, operator in turn pickup. 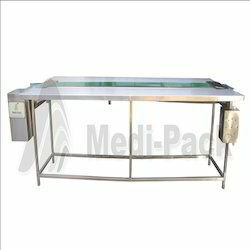 Offered conveyor belt is featured with belt-alignment system for long life & straight running of belt. Offered belt is demanded in pharmaceutical, chemical, food processing and other allied industries for conveying packed products from one place to another.